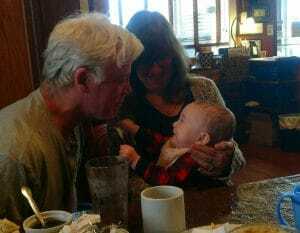 I’m grateful this week for a wonderful weekend in Virginia visiting with baby Brian. 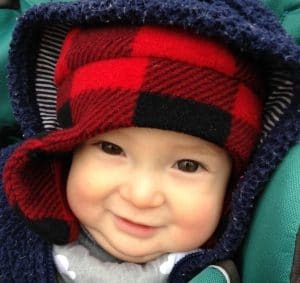 We spent 2 whole days looking at this amazing little guys smile. How can you not love that face? We took turns holding Brian. I don’t think we ever put him down. We took Amtrak instead of driving down this time. 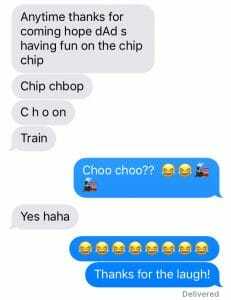 I’m grateful for the laugh we had on the “choo choo” ride home. I haven’t laughed that hard in a long time. It felt good. I do think the people around me were a little concerned though. I’m grateful these bridal shower favors turned out the way they did. I think the bride-to-be will be pleased. Don’t you love the delicate lace top? And I’m grateful for the reminder I saw on a poster. It was in one of the elementary schools I visited last week. 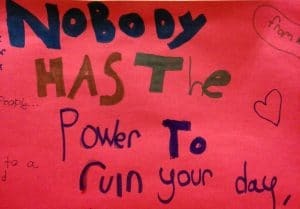 “Nobody has the power to ruin your day.” There’s a lot of wisdom in that sentence. Your posts are always so uplifting. I look forward to them, they make me smile. Happy you were able to see Brian. The soap is beautiful. Thanks Sharon, I always appreciate your comments! He’s so smiley and gorgeous! 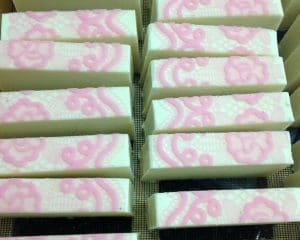 And that lace soap looks amazing. He is such a happy baby Donna. He truly is a joy!